This year, St. Patrick’s Day falls on Saturday. What a great opportunity for you, and especially the young people in your lives, to be part of the oldest continuous parade in honor of our Patron St. Patrick and the countless contributions that Irish men and women have made to their adopted country. People come from around the world to partake in the New York City St. Patrick’s Day parade, how fortunate are we that it is in our own backyard and how sad if we don’t take the opportunity? Anyone who has marched will tell you it is something you never forget. Once again, the Rockland County Ancient Order of Hibernians shall be running a bus to the Parade. The bus is free and open to Hibernians, their friends and families; all that is asked is that you march with the Rockland County unit. The Bus shall leave the MTA parking lot at the intersection of Rt. 304 and E. Washington Avenue, where there is ample free weekend parking. 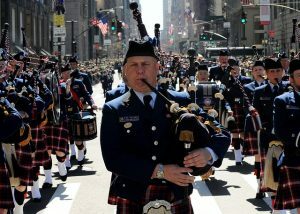 We step off from New York’s historic Roosevelt hotel where the County Parade puts on a fantastic demonstration of piping in the comfort of their spacious lobby. While the cost is free, we do ask people to help us get a head count by RSVP’ing below. Thank you in advance and we will see you on the 17th on the Queen of Avenues.